"The striking Leaping Tiger crest applied to the sides of the coaches, first in a triangle and then in a circle, appeared in the early 1930s on the Leyland Tigers. It is said that the first hand-painted image was copied from a cigarette card. This skilful freehand painting was carried out by Jack Mills who was trained as a professional painter. The design was used by Leyland as the badge for the Royal Tiger coach from 1949. The same design was used as the sign for the Royal Tiger pub in Leyland." The device faces forward on both sides, so Leyland must have used that on the offside of the Ellen Smith vehicles. Thanks to Pete Davies for his posting. I had wondered about the side logo since taking a few shots of this splendid vehicle at the Bus Meet-Bewdley 2013. I would be very interested in future posts relating to its history. What a great coach of the era, they were far better built and did not rattle in later life. Thank you, Nigel and Mike. I’ve wondered at intervals over the years which were the better-built vehicles, Duple, Harrington or Plaxton. Of course, I know that will provoke some comment on here!!!!! There were a couple of glimpses of an Ellen Smith coach at the end of Endeavour last night. Is this the only one in livery? And would it have worked in the Oxford area in period? This lovely coach appeared towards the end of an episode of ‘Endeavour’ on ITV Sunday 10 January 2015. Note that in the photograph the coach carries an ‘On hire to Yelloway’ window label. I have seen various photographs of the coach with this addition. However, it is perhaps the strangest item in respect of 1960s/1970s authenticity one can have on an Ellen Smith’s coach. Both Ellen Smith and Yelloway heralded from the Lancashire town of Rochdale and were great competitors. Hubert Allen and Harry Smith got together to discuss matters of mutual benefit or business interest but that was the extent of it. During my time at Yelloway in the late 1960s/early 1970s there was never any inter-hiring as far as I can recall. They did, in later years, participate in a joint service to Morecambe. I recall on a number of occasions when I worked at Yelloway being sent over to Newgate to furtively spy on Ellen’s excursion departures see if their loadings looked better than ours. What was a little irritating to me as I did my absolute best at playing an undercover spy was that most of the passengers recognised me and gave me a wave as they went by! Even Mrs B noticed the coach on the TV last night. Whilst an excursion may have taken one of Smith’s coaches into Morse territory, the use of the coach in the context of the programme’s plot did not fit. A shame really as the previous week the use of two preserved Oxford double deckers was very much in context. You noticed, David! I wondered who would be first. I thought it a bit of an oddity when I saw the sticker. I can’t tell from Nigel’s view whether it appears there or not. Interesting comment, Roger! I’d have thought there might be a difference between, say, AEC and Guy affecting the way the body moved or didn’t, but I wouldn’t have expected it between models from the same line. Ah well, We live and learn! For me Pete, all through my driving days I aspired to one day having charge of a Harrington, be it AEC or Leyland no matter! It never happened . . I agree with Roger, the rattles depend a great deal on Chassis, a Duple on a R226 SO different to an AEC or Leyland. My personal pet hate was a Yeates – always seemed to leak around the myriad rubber window seals. I doubt that Ellen Smith vehicles would have visited the Oxford area on any regular basis as most of their operations were in the north west. They did a good deal of business in the winter months running supporter’s coaches for the away games of Rochdale Hornets. They also provided the team coach, complete with distinctive headboard for many years. Many’s the trip I made across Lancashire and Yorkshire to far flung destinations such as Dewsbury, Batley, Leigh, Widnes and numerous other rugby league playing towns. It was usually on one of the earlier Cavalier bodied 36ft Leopards. The fleet was always immaculately turned out and the fares were always very reasonable. A truly quality operation. I made a day trip with Ellen Smith from Rochdale to the 1974 Commercial Motor Show at Earl’s Court. The transport was a Plaxton Panorama Elite-bodied Leyland Leopard. The main thing I remember is the rather low back seats which were a bit of a surprise for such a long trip, although they were more than bus seats. The latest episode of Endevour had a Burlingham Seagull coach in a red and blue livery dropping a character off in central Oxford. Sadly it was too far away to see what it was. 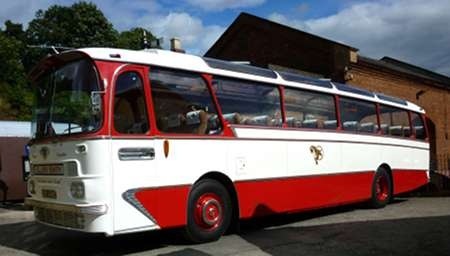 The Seagull was the preserved Whittles of Kidderminster Seagull on a Leyland Tiger Cub chassis owned by Bernard Rodgers of Bewdley. His standard of presentation is always top class and it could be argued looked too good for the role of delivering passengers back from holidays. In the mid 1950’s Leyland abandoned their heavyweight underfloor-engined Royal Tiger model in favour of the very much lighter Tiger Cub. Most export customers however required something rather more substantial, so the opportunity was taken to revamp the old Royal Tiger into a longer and even heavier duty chassis to meet their needs. So was born the Royal Tiger Worldmaster. Where the old model had only a manual gearbox option, the new one had only Pneumo-Cyclic transmission as standard. It, along with its integral equivalent the Olympic II, went on to be – undoubtedly in my mind – the most successful model Leyland ever built. Some home market customers still looked towards something with more clout than the Tiger Cub, and a 30ft. version to suit home market requirements was introduced – the RT3/1 bus and RT3/2 coach. Glasgow bought a large batch of the bus version in 1956, and my own local operator – Halifax Corporation – took nine in 1958, but here climbing Bradford Road out of Stump Cross near my then home is SDK 442, a 1958 Plaxton Consort-bodied RT3/2 coach of Ellen Smith’s Tours, of Rochdale. 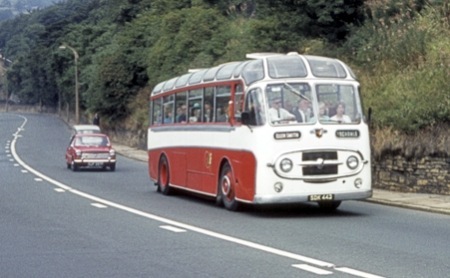 One of two with Smith’s, it was later rebodied with a Plaxton Panorama Elite body – surviving until the company eventually sold out, and now preserved. Very nice, John! I have read somewhere – but can’t lay my hands on it at present – that the "leaping tiger" logo of the Royal Tiger was based on the Ellen Smith logo which, in turn, had been inspired by a picture on a card such as used to be included in cigarette packets. A superb vehicle owned by a superb operator which offered a quality friendly service of excursions and tours from my childhood home town of Rochdale. 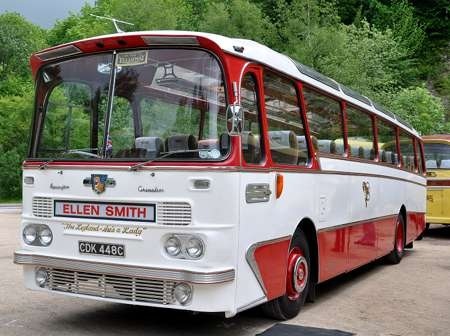 Every other Saturday during the rugby season I would travel on an Ellen Smiths coach to Rochdale Hornets away games. Each coach had a dedicated driver who took pride in the appearance of his own vehicle. While SDK 442 was around at that time we usually travelled by one of the later Harrington Cavalier bodied 36ft Leopards but I did travel on SDK after it was rebodied. I believe Ellen Smiths had dispensation from Leyland to use their ‘pouncing tiger’ badge as it’s fleet logo which can just be seen on the photo on the side of the coach. Perhaps someone can confirm or otherwise. "The striking Leaping Tiger crest applied to the sides of the coaches, first in a triangle and then in a circle, appeared in the 1930s on the Leyland Tigers. It is said that the first hand-painted image was copied from a cigarette card. This skilful freehand painting was carried out by Jack Mills who was trained as a professional painter. The design was used by Leyland as the badge for the Royal Tiger coach from 1949. The same design was used as the sign for the Royal Tiger pub in Leyland." Yes, John D, that is the tiger. It always faces "forward" on the side of the vehicle. That on the Leyland badge goes to the viewer’s right which suggests to me that they used the one from the offside of an Ellen Smith coach. Yes that’s the Tiger logo and thanks for clarifying the tie up with the Leyland badge. To conclude the Ellen Smiths story, Harry Smith sold out to Rossendale Transport on retirement and the new owners ran the business as a separate entity for some years. The red and white livery and name were retained. I left the area shortly after and am not sure if the name still survives. Mention of Harry Smith reminded me when I drove for Stanley Gath Coaches of Dewsbury. We frequently went on hire to Ellen Smith. We were given a reporting time by Harry who was quite pedantic about this time. If we were due to report say at 8 a.m. he told us we were not to arrive before the stated time or else. As we had come via the M62 we often had to sit and wait just up the road and then arrive as if we had come nonstop. I was always interested in the withdrawn vehicles that were dumped at the back of the garage. Just a point to ponder. Was there something in the water in Rochdale. Not one, not two but three top notch operators. Yelloway, Ellen Smith and the Corporation. David, probably a matter of what wasn’t in the water. The stuff down here in Hampshire is nothing like the real stuff off the Pennines! It’s that Legionella bacteria what gives Pennines water its bite! Did Legionella give rise to one of Harrington’s biggest mistakes? …..and the Ellen Smith Flickr group has pictures of this vehicle with it’s Elite body (as a museum exhibit) and also of ODK, rebodied in the sixties as a Panorama, in service. Was Ellen Smith the name of the woman who started up the company, or what is the origin of this name? Yes, Mrs Smith’s first name was Ellen and she seems to have founded this element of the family’s interests. Philip, just read your comments about the late Harry Smith. You mention Stanley Gath. You might remember Stanley invited a group of Ellen Smith drivers to a "Yorkshire Coach Drivers" social evening in Ravensthorpe near Dewsbury (1966). We hired a coach from a Mr. Norman Fletcher (Harry would’t let us have one) and drove across to Ravensthorpe and as I remember we had a very enjoyable night. The outcome of this though was that for the next four years we at Ellen Smith decided to hold our own "Lancashire Coach Drivers" social evening at the end of the season. All due to Stanley Gaths hospitality in the first place. 1. the company was founded by Eric’s grandmother Ellen Smith using money from taking in washing/sewing. 2. Originally the company owned trucks that delivered goods during the week and could be converted for passengers at the weekend. 3. Eric worked for the family business for most of his life up to the late 90’s when he retired due to ill health, specifically lung cancer. He died in October 2000. 4. I was always told that the tigers were hand painted on by my uncle Jack Mills based on a picture on a cigarette pack. Thank you Helen, for adding to the information we hold. Do you have a photo of any older company buses that you think we’d like to see? Chris, here’s one of Ellen Smith’s early vehicles:- www.flickr.com/photos/ There are more if you follow through on Ellen 137’s photostream. Having worked for the Accountants of Ellen Smiths the books were always spot on and Eric and Harry were controlled by I think it was Margery !! I have in my possession the original cast iron company seal of Ellen Smith (Tours) Limited which was being discarded when the Company was taken over. If anyone wants this piece of history please let me know through the site. I would suggest the Manchester Museum of Transport would be a good home for the seal. They even have an Ellen Smith’s coach – the one above no less with its later body! I can help arrange if necessary. Two points, the Halifax Worldmasters were incredibly slow vehicles, all the more surprising given the engine size. I would prefer to wait 5 minutes extra and catch the Hebble and still be in Northowram quicker than a Worldmaster. Also they had awful tin can Weymann bodies, so I really hated them! 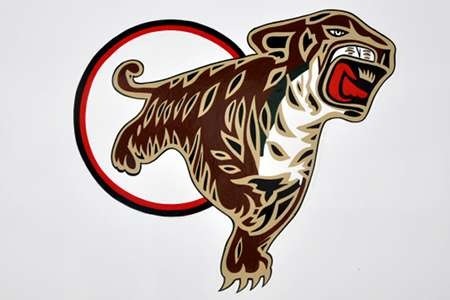 Second, does anyone know why Ripponden & District (coaches) and Ellen Smith both had the same, or similar, logo’s of the Tiger? I remember both these coaches parked up at the side of the office back in the mid 70s. They were in a far sorrier state. I played in them quite a few times. There were always feral cats giving birth to kittens. As I got older, early teens I was paid by the drivers to clean the coaches when they came back. Good happy years they used to take me everywhere. So glad to see them in lovely working condition. Thanks for reminding me.